Following an invited competition, Hewitt Studios have been appointed to prepare a Community Right to Build Order (CRtBO) for the redevelopment of Freshford Village Memorial Hall. 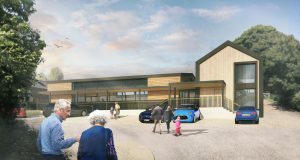 We have developed plans for a modernised, enhanced and extended village facility, providing a welcoming and flexible venue for community wellbeing, whilst complementing its outstanding rural setting. The final proposal will be refined via an extensive community consultation exercise, culminating in a local referendum which will determine whether to grant a Community Right to Build Order – the first such democratic process in the region. Full details of the CRtBO process can be found on the Hall’s website. The refurbished Freshford Village Memorial Hall will be a special facility born of a special place and should provide an exemplar model for future community hall projects – a uniquely accessible, flexible and (in every sense of the word) sustainable space that makes the most of its wonderful surroundings – offering an exceptional experience to all its users.